Camera & Lenses What is the Difference Between the Canon 1 DX Mark II & Nikon D5? 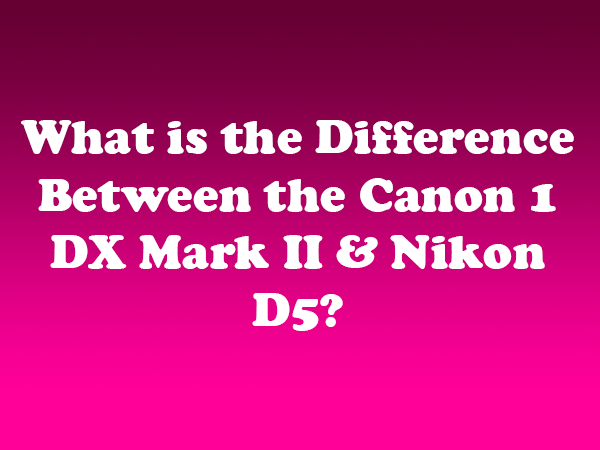 What is the difference between Cannon 1DX Mark2 and Nikon D5? Nikon and Cannon both announced new full-frame flagship DSLRs this winter. Canon’s 1D X Mark II and the Nikon D5are both top of the line. However, there are a few key distinctions that are worth considering. To start, both DSLR’s are powered by new technology. The Canon 1D X Mark II features Dual Digic 6+ processors, while the D5 introduces Nikon’s new Expeed 5 engine. • Exposure metering sensor: The Cannon’s RGB metering sensor has a total of 380,000 pixels, which is more than twice the 180,000 pixels of the Nikon D5’s pixel metering sensor. • ISO Range: The Nikon D5 boasts a range of 100-102400 (50-3280000 when extended). Meanwhile, the Canon 1D X II’s ISO range runs from 100-51200 (50-409600 when extended). It will be interesting to see how much difference the higher range makes in practice. • Autofocus system: The D5 features a 153-point, which tops the 1DX Mark2’s 99 cross-type AF system. • Continuous shooting speed: The 1D X Mark II is a faster camera, 14 fps vs. 12 fps with AF/AE. • Battery life: The Nikon’s battery life is far superior at 3,780 shots (CIPA) compared to the Cannon’s 1,210. • Video capability: Both cameras have 4K video recording capabilities. However, Nikon has a three-minute video recording limit. • Price: The MSRP of the Nikon D5 is $6,499, while the Cannon 1DX Mark2 will retail for $5,999. As reviewers have noted, a $500 difference isn’t as significant when you have already committed to spend $6,000 on a new DSLR. Both cameras each have a few unique features. For instance, the Cannon comes equipped with GPS technology, which allows users to geotag images. The Nikon has two memory card options — dual XQD slots or dual CF slots. Since both cameras are not yet released, we can only compare specifications. It will be interesting to see how they stack up in the real world.